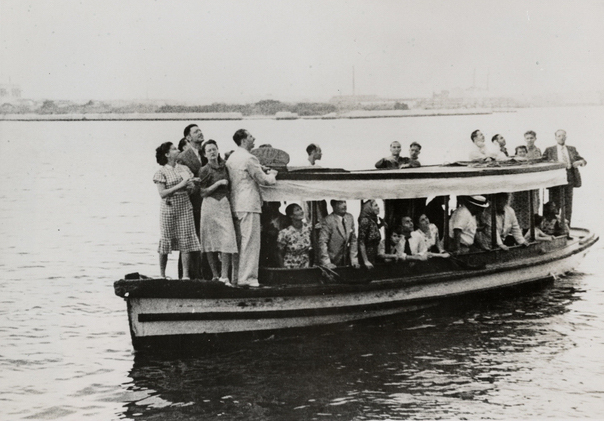 In an effort to flee Nazi Germany, more than 930 refugees sailed from Hamburg on May 15, 1939 on the S.S. St. Louis and reached Havana, Cuba, on May 27, 1939. Arrangements for the voyage were organized independently by the Hamburg-American Line, without the involvement of any Jewish organizations. 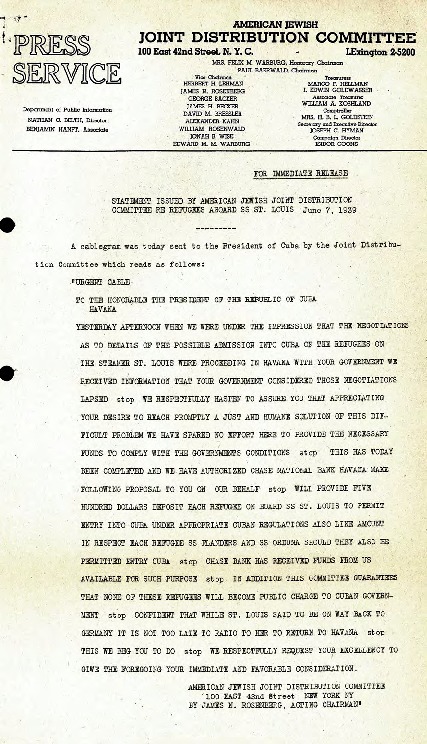 After the Cuban government refused to honor the refugees’ accredited landing documents, however, JDC became involved in negotiations with the Cuban government. These discussions unfortunately failed, as did efforts by JDC to find a haven for the desperate refugees elsewhere in the Americas. After 12 days of waiting, the St. Louis sadly headed back to Hamburg with 907 passengers. While the St. Louis was on the high seas, JDC, in close cooperation with other groups, negotiated with the governments of Holland, Belgium, England, and France to accept the refugees until homes in other countries could be found. JDC posted a cash guarantee of $500,000 ($500 per refugee) in order to make the arrangement feasible and to cover upkeep costs wherever necessary. When it reached Europe, the ship was able to dock in Antwerp, where the passengers disembarked. 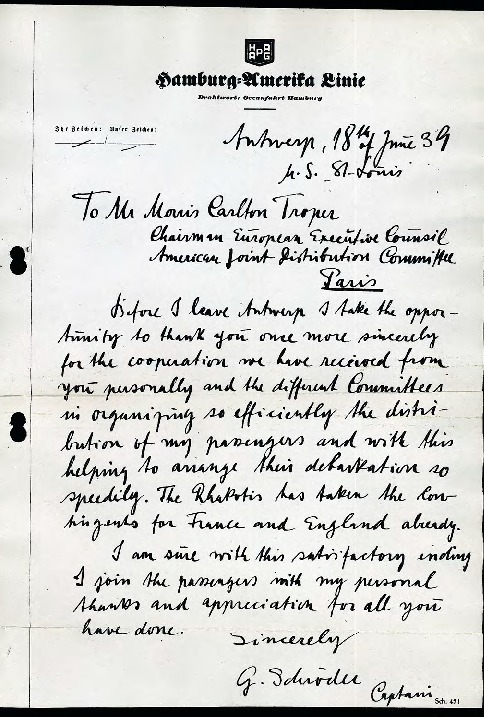 In England, JDC continued to support the last of the St. Louis refugees until 1948, but in France, Belgium, and Holland, the Nazi occupation reduced the channels of outside aid and ultimately brought those routes to a standstill. After the occupation of France, some St. Louis refugees escaped to Switzerland. But there were others who had returned to Europe on that fateful ship who ultimately met a tragic end in concentration camps. Some of the 907 passengers on board the St. Louis arriving in Belgium after being refused entry into Cuba and the U.S.
“The Voyage of the St. Louis,” JDC Report (probably by Joseph C. Hyman), June 15, 1939. 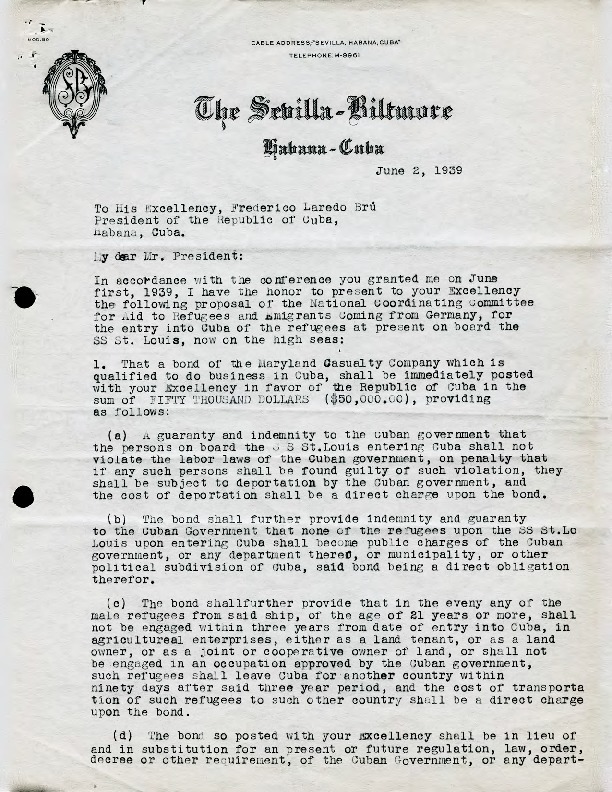 Proposal from Lawrence Berenson to Laredo Bru, President of Cuba, June 2, 1939. 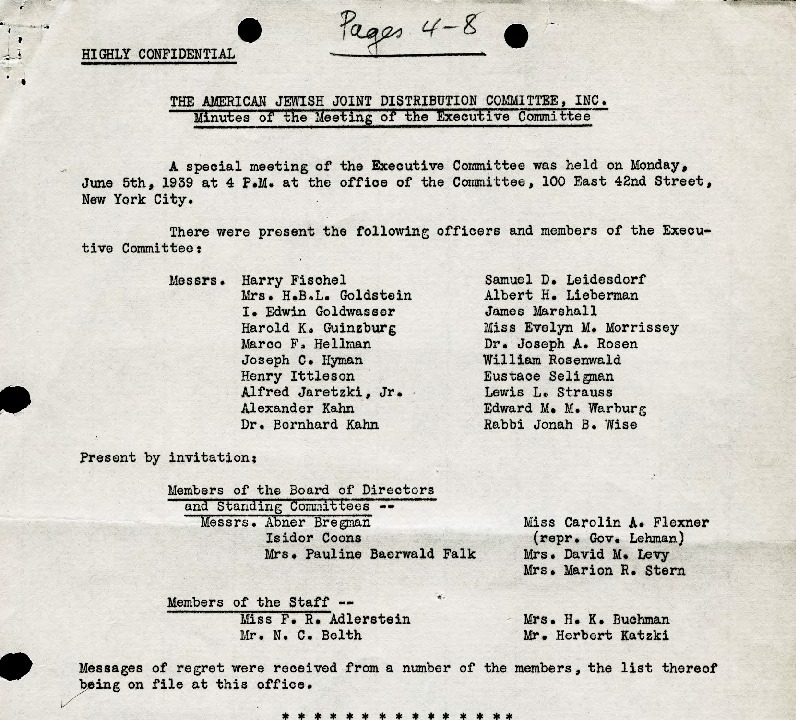 Excerpt from Minutes of the Meeting of the JDC Executive Committee, June 5, 1939. Letter of Alfred W. Barth, The Chase National Bank, to JDC, June 7, 1939. 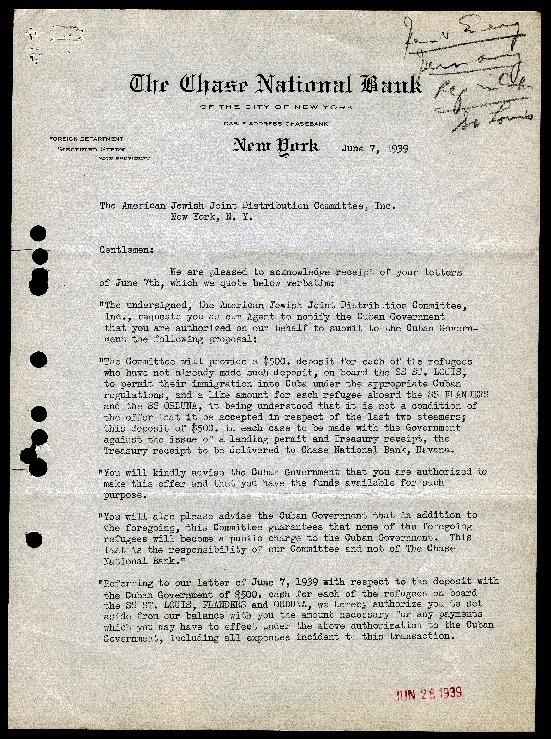 “Statement issued by American Jewish Joint Distribution Committee Re: Refugees Aboard SS St. Louis,” JDC Press Release, June 7, 1939. 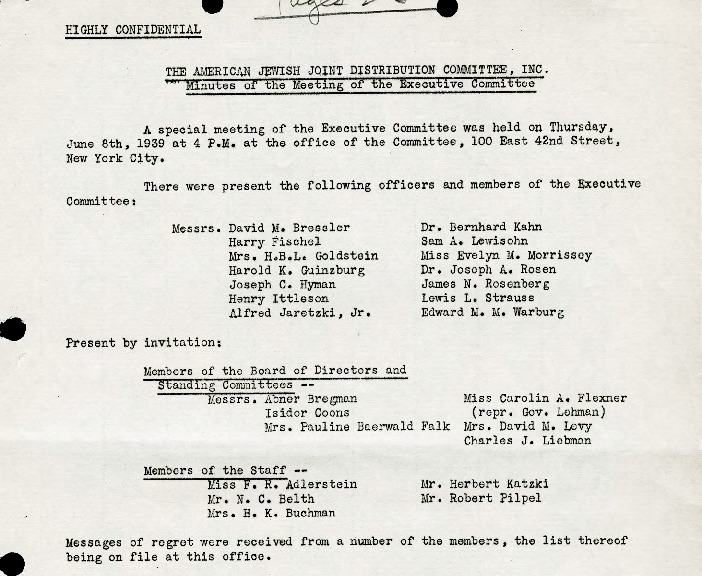 Excerpt from Minutes of the Meeting of the JDC Executive Committee, June 8, 1939. 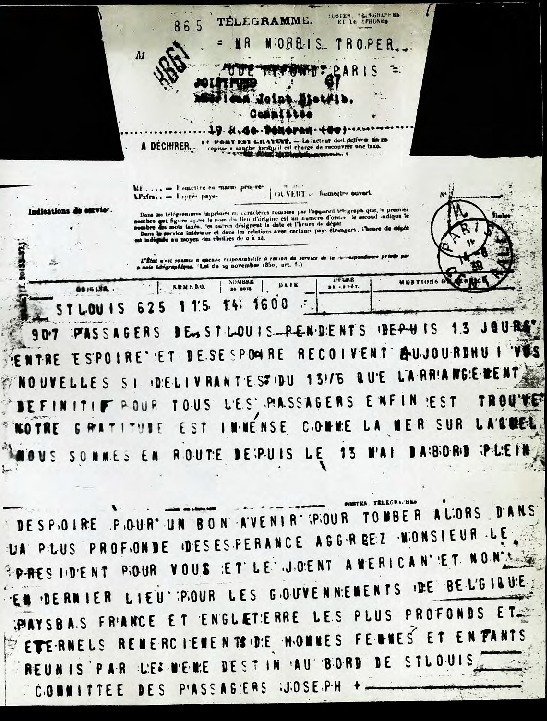 Radiogram from St. Louis passengers to Morris Troper (French), June 14, 1939. 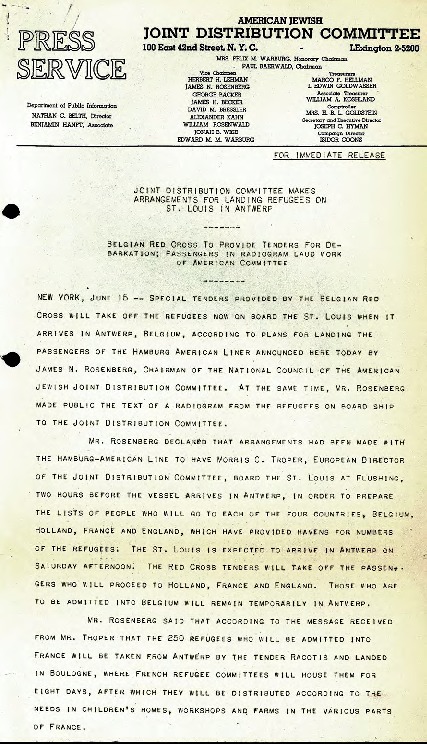 Telegram of Morris Troper to JDC New York, June 15, 1939. 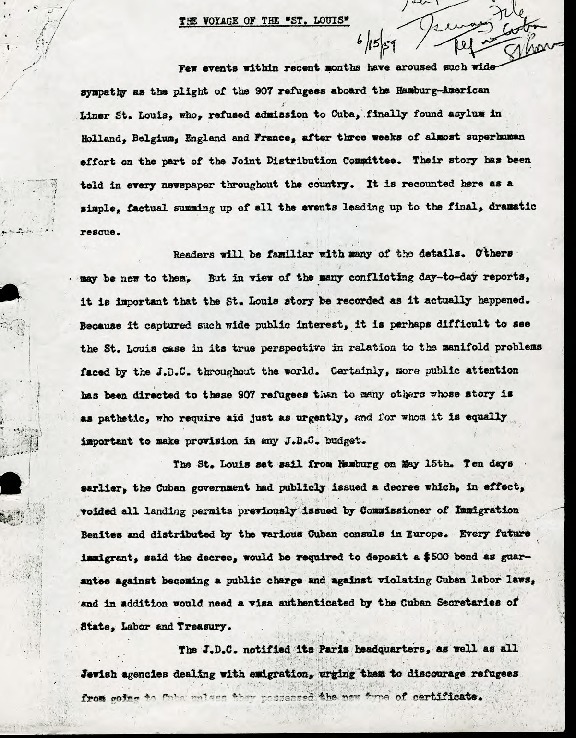 “Joint Distribution Committee Makes Arrangements for Landing Refugees on St. Louis in Antwerp,” JDC Press Release, June 15, 1939. 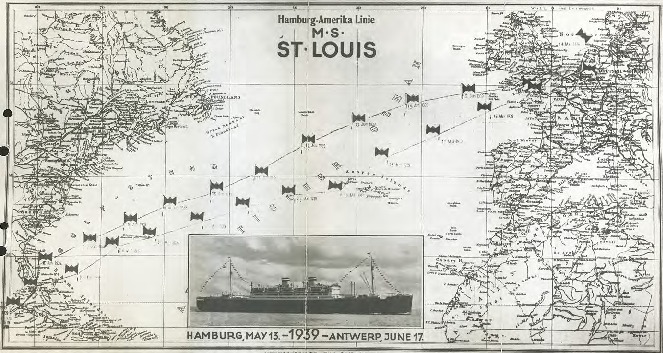 Map Showing the Voyage of the St. Louis, May 13-June 17, 1939. 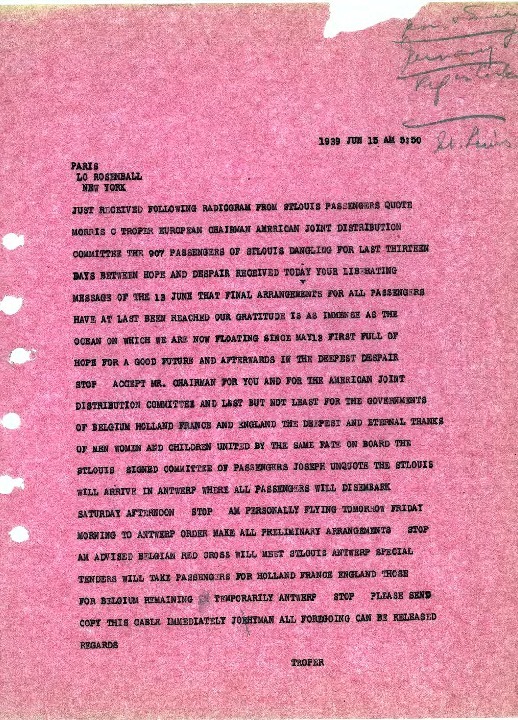 Letter of Captain G. Schroeder to Morris Troper, June 18, 1939. 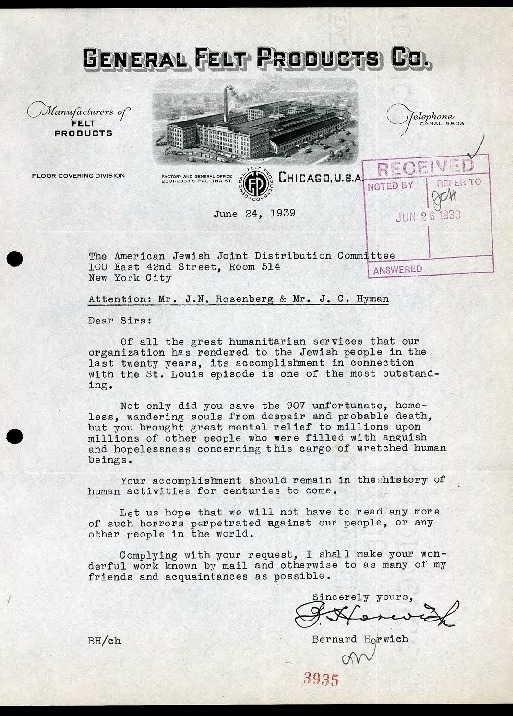 Letter of Bernard Horwich to J. Rosenberg and J.C. Hyman, JDC, June 24, 1939. 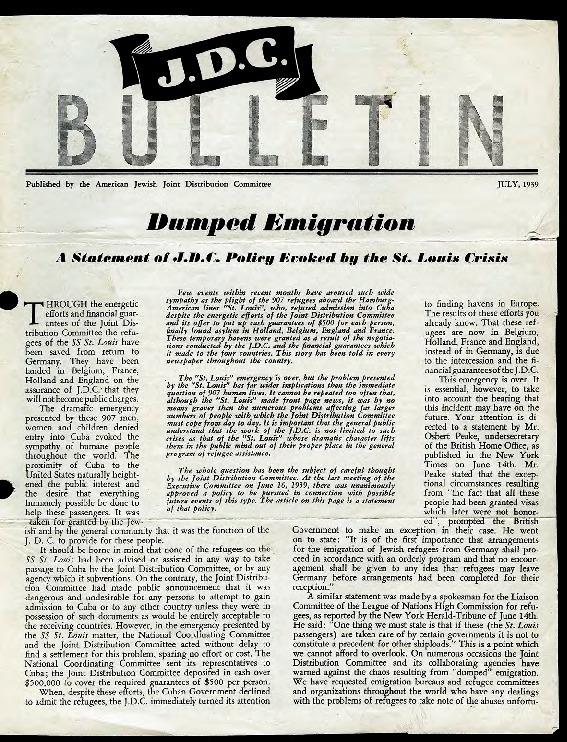 “Dumped Emigration: A Statement on JDC Policy Evoked by the St. Louis Crisis, JDC Bulletin, July 1939. 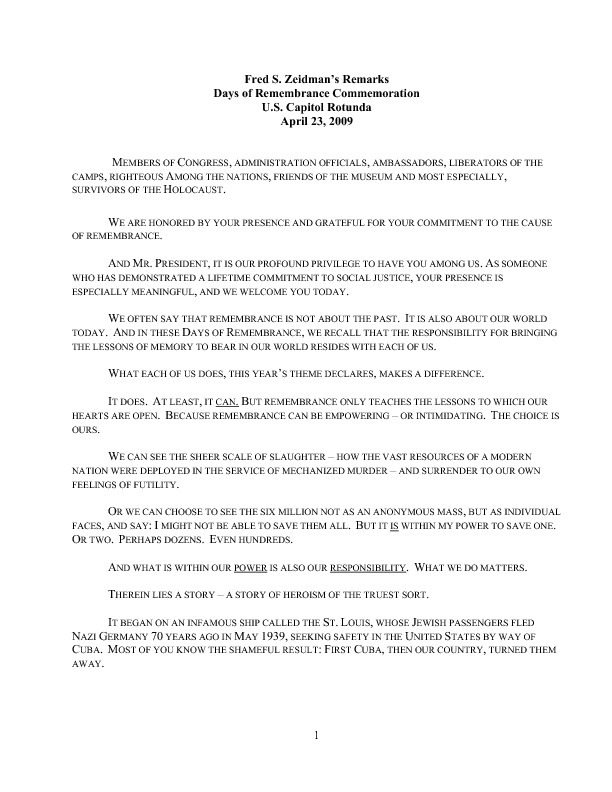 Yom Ha-Shoah Remarks of Fred S. Zeidman at the Days of Remembrance Commemoration, U.S. Capital Rotunda, in the presence of President Barack Obama, April 23, 2009. 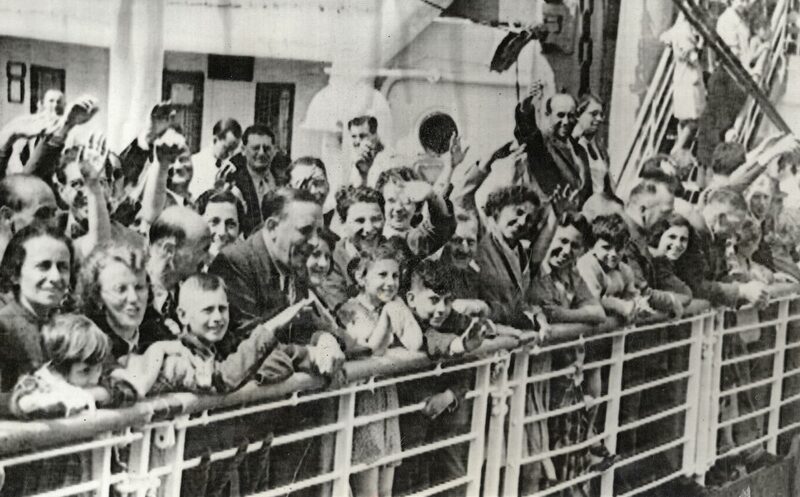 Relatives and friends of the refugees from the S.S. St. Louis wave farewell to their loved ones as the ship heads back to Europe.